$uccessful Landlords | Zaran Sayre & Assoc. Available on Kindle for just $9.99! If you are a landlord, or thinking about becoming one, this book can change your life and may be the best investment you ever make! 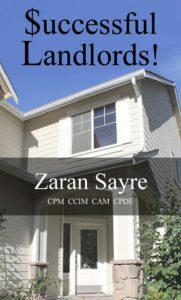 Zaran takes his 50 years of landlord experience and compresses it into a few pages – putting you on the path to $uccess. Years ago being a landlord was driving him nuts. Today, he and the team at Zaran Sayre & Associates manage hundreds of rentals. Even experienced landlords can benefit from the information in this book. Times have changed, but the skills needed to be a successful landlord have not. The skills he presents to you will work in any market conditions and are good for a lifetime.